Claire Coder spends her days talking about feminine hygiene. Her business, Aunt Flow – which started this year and officially launched in May – is a buy one/give one subscription tampon service that donates a box of products to one of their partner organizations. Last year, Coder started her first – and only – semester at OSU. She knew going to college was expected, but the experience just didn’t feel like it was for her. “I frequently cut class. I found myself traveling to business meetings all over town, attending networking events, and exploring Columbus. I was itching to get away from campus and understand what the city had to offer,” she explains. Coder’s exploration of the city also brought her front and center with Columbus’s poverty and homeless. She wanted to help, but was tired of giving charitable contributions; she felt like she needed to do something more, something that while it wouldn’t solve poverty, would provide a sustainable solution. That solution came to Coder through conversations with her mother – an art therapist. Coder’s mother talked a lot about the issues her Women’s Group faced. Especially how difficult it was for them to get feminine hygiene products. This was a problem and Coder was beginning to think up a solution. Last November, she attended my first StartUp weekend at CoverMyMeds. During this three day long event, she pitched her buy one/give one concept for feminine hygiene products. After presenting the idea for the business Aunt Flow, and placing second, Coder knew she wanted to move forward with the concept. 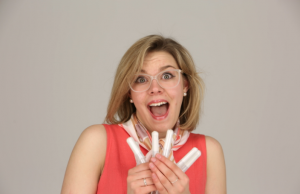 “My dream to launch a company that would create a sustainable solution to the dire need for feminine hygiene products was coming to life,” she recalls. As Coder spent the next several months developing and growing Aunt Flow, one thing became clear. She needed rethink if college was for her. After a tough decision, and many discussions with her family, she decided it was time to leave college and focus on Aunt Flow. “For me, success is not a college degree, it is how comfortably you can talk about tampons,” Coder declares. 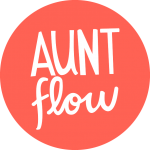 Starting in January of this year, Coder worked to bring Aunt Flow to life. And on May 12, she announced the business to the world and launched a crowdfunding campaign on Crowdrise to raise $25,000. You can learn more about Claire Coder and Aunt Flow by visiting online at www.auntflow.org. You can also follow along with all things tampons and periods by checking out the Aunt Flow YouTube channel, or following them on Facebook, Twitter, and Instagram. You can also donate though their Crowdrise campaign by clicking here.